One of the most important renewable energy sectors, as we move forward and continue to shift away from fossil fuels like coal and natural gas, is the offshore wind industry, which boasts high-yield renewable energy generation done at increasingly lower costs, and done so safely away from the majority of witnesses. It is the perfect clean energy technology. The offshore wind industry has, for the most part, been centred firmly in Western Europe. As of the end of 2017, the United Kingdom led the way with a total of 6,386 megawatts (MW) worth of offshore wind power installed, followed by Germany which boasted 5,355 MW. Denmark and the Netherlands each boasts over 1 gigawatt (GW) worth of offshore wind, and Belgium is not far off that marker either. 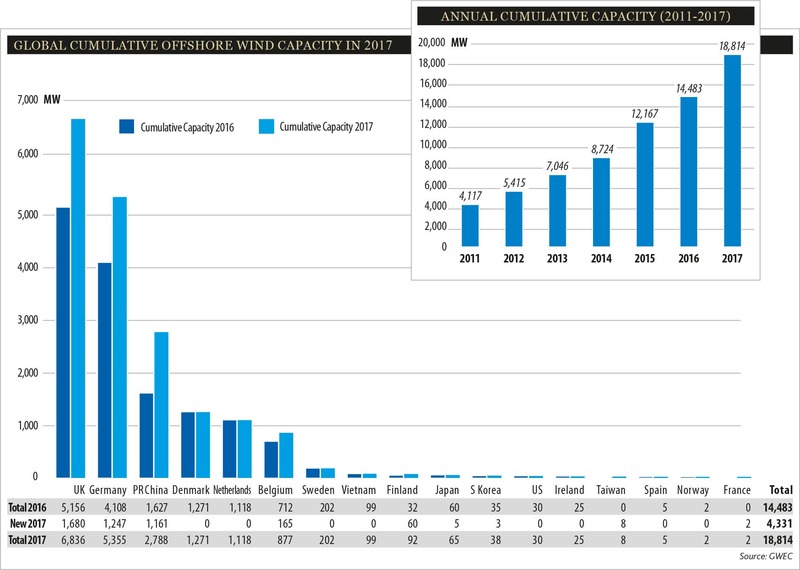 Unsurprisingly, China is the regional ‘odd one out’ with 2,788 MW worth of offshore wind installed at the end of 2017, taking third place and the only non-European country to have over 100 MW worth of offshore wind. That, however, may soon quickly change. While it is never as simple as finding a single starting point, the first big rumblings about a Taiwanese offshore wind energy industry were sparked back in early 2017 when then-DONG Energy (now Ørsted) announced that it had acquired a 35% stake in the country’s first offshore wind project — the 120 MW Formosa 1 project. DONG Energy joined Macquarie Capital (50%), and Swancor Industries (15%) as co-investors in the project. However, the Formosa 1 project is only one aspect of a burgeoning Taiwanese offshore wind industry that has so far involved big-name Western company’s including Ørsted and Siemens Gamesa, as well as MHI Vestas Offshore Wind (MVOW) and Copenhagen Infrastructure Partners (CIP). In the lead-up to a vital offshore wind tender, these companies began making moves into the country in preparation. In March, wind turbine manufacturer MHI Vestas signed four Memorandums of Understanding (MoUs) with leading local companies to begin building out its supply chain in the region, and followed that up in May with a fifth MoU and the commitment that its 9 MW wind turbines will be typhoon-ready by 2020 — a necessity for offshore wind development in the region. Siemens Gamesa similarly began making inroads into Taiwan, signing several MoUs in December and February. Maybe the biggest move, however, was made by Danish offshore wind behemoth Ørsted which, in December announced that it was moving forward with its plans for 2 GW worth of offshore wind projects as part of its Greater Changhua project, and set itself up to support not only the development of the country’s offshore wind industry but to do so with locally-sourced material and labor. All of the hard work and preparation has paid off, however, as the Taiwan Ministry of Economic Affairs announced earlier this month that it had awarded seven companies to build 10 offshore wind farms worth a total of 3.8 GW by 2025. Specifically, the seven companies included state-run Taiwan Power and the largest steel-maker in Taiwan, China Steel Corp., but the big winners were Western companies Copenhagen Infrastructure Partners, which won 900 MW, German developer WPD with 1,073 MW, and Ørsted which won 900 MW. CIP was awarded 600 MW for two projects, the Changfang and Xidao projects, located 13 to 15 kilometers off the coast of Changhua County, as well as a separate 300 MW project which it will develop with China Steel. German wind power developer WPD was awarded just over 1 GW for its Yunlin and Guanyin projects. The Yunlin project will consist of between 650 MW and 700 MW and will be built 8 kilometers off the coast of Yunlin County, and set for commission in 2020/21. The Guanyin project will be around 350 MW in size and build 2 kilometers off the coast of Taoyuan County and is set to be commissioned in 2021. Ørsted was awarded the right to build two of its Greater Changhua projects, the 605 Changhua 1 and the 295 MW Changhua 2. The 900 MW grid capacity allocated to Ørsted means that its sites have a remaining 1.5 GW available in the leased area which the company hopes will be allocated across three projects in future auction rounds. The company won’t even necessarily have to wait very long, either, as the Taiwanese Government is expected to award the remaining 2 GW of its promised 5.5 GW through a tendering process likely set for June. But why Taiwan? Given the commitment to offshore wind in western Europe, and Taiwan’s proximity to China, what is behind this sudden rush to South East Asia? There is obviously always a desire for companies to diversify their markets and market share, but what was it about Taiwan that has drawn so much attention so quickly? There remains a significant factor that is acting like a gravitational weight on Taiwan’s nascent offshore wind industry, and that is the proximity of, and Taiwan’s antipathy towards, its nearest neighbor, China. Without getting into the deep and convoluted political history between Taiwan and China, it is sufficient to say that there is not a lot of trust to share around. This partly explains why China is not more involved in Taiwan’s offshore wind industry, but it’s certainly not the only reason. These dueling tensions, therefore, begin to explain Taiwan’s increasing importance in the region, and its attractiveness to Western companies. China will continue to rake in its share of global offshore wind capacity, but it won’t necessarily be impacting the global offshore wind market given its reliance upon its own supply and regional concerns of Chinese intervention. And attract foreign players they certainly have. “Taiwan is a key market for Siemens Gamesa in the region,” added Andreas Nauen from Siemens Gamesa. There are still remaining challenges for the Taiwanese offshore wind industry as it sets off, but in some regards, the majority of these challenges were inevitable, and would and will apply to any new supply and development hub, no matter where it’s located. Taiwan suffers from a “Lack of fully established supply chain and local developers’ lack of development experience will boost Taiwan’s offshore wind project cost,” explains Zhou, and “public opposition to wind power might further complicate the project permission in Taiwan” — though that will only be confirmed as time passes, and can be successfully mitigated by full integration of local input. Tracks of all tropical cyclones in the northwestern Pacific Ocean between 1980 and 2005. Taiwan does have one challenge that other regions don’t have to deal with, however — Mother Nature. “The frequent typhoon and earthquakes will add on additional risks of operating offshore projects in Taiwan,” Zhou suggests. Taiwan is beset by typhoons — an issue that, as the planet’s temperature warms, will greatly affect the frequency and severity of typhoons and make already dangerous weather conditions even worse. In August of 2009, Typhoon Morakot blew in to East Asia and caused 789 fatalities, including 673 in Taiwan in what was the deadliest and wettest typhoon in the country’s history. Any wonder, then, that MHI Vestas was proud to announce its offshore wind turbines would be typhoon-ready by 2020. Not only is Taiwan directly in the path of numerous well-worn typhoon paths, but it is similarly situated directly atop the Pacific Ring of Fire, a near-continuous series of tectonic plates that arches around the Pacific Ocean and affects eastern Asia and the Pacific and the west of North and South America. Geologists have identified 42 separate active faults on the island of Taiwan. Considering the future of the offshore wind industry is a lot like exploring its present — Western and Northern Europe will dominate. 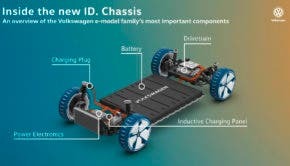 The United States is slowly getting started — although recent developments in Massachusetts, Rhode Island, and New Jersey have given the country a 5 GW kick in the pants — and there are new markets getting underway, including the likes of Turkey and India, as well as Asian powerhouses like Japan, Vietnam, and of course Taiwan. Australia’s first (and currently only) offshore wind project is the 2 GW Star of the South offshore wind farm, which is in early development by Victorian-based developer Offshore Energy and Copenhagen Infrastructure Partners. Meanwhile, India is on track to conduct a 5 GW auction sometime this year after the country’s Ministry of New and Renewable Energy recently issued an expression of interest document (PDF) on its website. Given all this, Taiwan is not only relatively well positioned to secure its place as the regional hub for offshore wind development in the Asia Pacific — or at the very least East Asia — the country is also likely to be one of the world’s leading offshore wind countries by 2025, and maybe even earlier. With strong governmental support, not to mention favorable wind conditions and locations, Taiwan is tapping into a market with massive potential for growth, and one that could remake the global energy landscape.